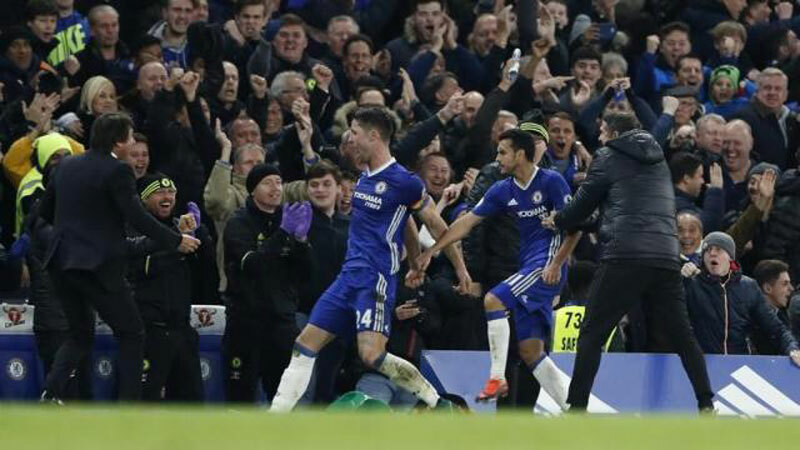 Chelsea stayed at the top of the Premier League after coming from a goal down to beat Tottenham Hotspur 2-1 at Stamford Bridge on Saturday after earlier winners Manchester City and Liverpool also briefly scaled summit on a topsy turvy day. City came from behind to beat Burnley 2-1 with two Sergio Aguero goals in the day's early kick off with Liverpool later edging above them on goal difference after Divock Origi and James Milner finally broke fierce Sunderland resistance in a 2-0 win at Anfield. 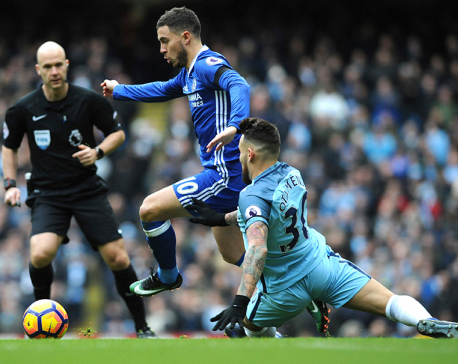 Chelsea goals either side of halftime from Pedro and Victor Moses cancelled out an earlier strike by Christian Eriksen to end the league's last unbeaten record and secure a seventh successive league victory for the Blues, who retain a one-point lead over their two closest title rivals. That winning run has coincided with Moses securing a starting spot and the Nigeria international, so long the forgotten man at Chelsea, was particularly impressive on Saturday, charging down the right to collect Diego Costa's pull back on 51 minutes, firing the ball into the net off Jan Vertonghen. "I was very pleased with the goal," said Moses, who spent the previous three seasons on loan at Liverpool, Stoke City and West Ham United before Antonio Conte converted him into a wing back. "I am delighted to have found a home. I am pleased to be playing this season. The manager gave me the chance to express myself and I am relishing it." Eriksen had slammed home a thunderous finish from just outside the area to put Spurs ahead after 11 minutes, before Pedro turned neatly and curled in a magnificent shot to level just before halftime. City and Liverpool had earlier both struggled for their victories with the Reds' win over Sunderland coming at a potentially high price with an ankle injury to Philippe Coutinho, who left the ground on crutches with his left foot in a protective boot. Liverpool manager Juergen Klopp said it was too early to say how serious the injury is after the Brazilian came off second best in a challenge with Didier Ndong late in the first half. But with Adam Lallana already out injured, the German faces a nervous wait for Coutinho's scan results. On the pitch, Coutinho's replacement Origi eventually made the breakthrough against Sunderland with a shot that looked more like a cross from the left of the area. Milner scored their second after Sadio Mane was fouled in the box. 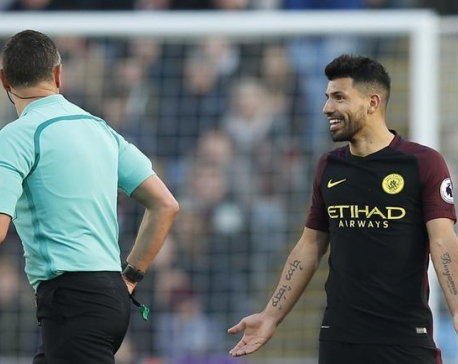 At Turf Moor, Pep Guardiola made five changes to the Manchester City side that played in the Champions League in midweek, but he knows better than to start without Aguero, whose double strike secured the comeback win. The goals take the Argentine's tally to 33 in his last 34 Premier League games, coming after Dean Marney put the home side ahead with his first league goal in seven years. There was more late drama at Leicester City, where Islam Slimani put away a 94th-minute penalty, Leicester's second of the match, in a 2-2 draw after Alvaro Negredo thought he had done enough to secure a rare Middlesbrough away win with goals either side of halftime. The bottom of the table is looking increasingly congested with just six points separating 10 teams.